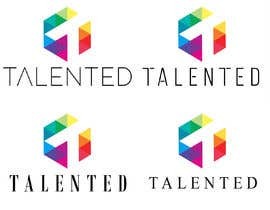 Design a logo and icon for a brand called “Talented”. Simple black font for the name "Talented" and an icon to be used for print, web, and app icon. The Icon can be black, gold, or multicolored. See below for more info on the design concept. Simple yet Unique is best. 1) Don't use people/plants/animals in the design. 2) I'm not looking for a design with the letter "T". 3) Symmetrical, multicolored Icons will be considered as a priority. 4) The font should look like a Luxury brand, preferably all capital letters. Dear CH, at least respect who make original work. Thank you to all of the designers. I was overwhelmed with options. There were some amazing designs as you can see from the number or 5 and 4 star ratings. I thank each of you. It's not even free stock image!! This is stealing! As far as I know that's forbidden. It's not fair as well. Why we have to bother to spent hours for making a logo when we can download (or steal) an image and make it in a minute? Not fair at all. The designer who won this contest is a thief and must be reported! Your selected design is copied. Thank you for submissions. Here are tips for successful entries: 1) Don't use people/plants/animals in the design. 2) I'm not looking for a design with the letter "T". 3) Symmetrical, multicolored Icons will be considered as a priority. 4) The font should look like a Luxury brand, preferably all capital letters. Hello sir please check #166#355. Any change please inbox me. #611, hi,pls check the logo, give your feedback,ths. check #466 ... . .
#433, hi,pls check the logo, give your feedback,ths. Thank you for the rating. Let me know if you would like to see any changes, or even a personal input. Thanks.